- Spray painted the front of the monitor black. 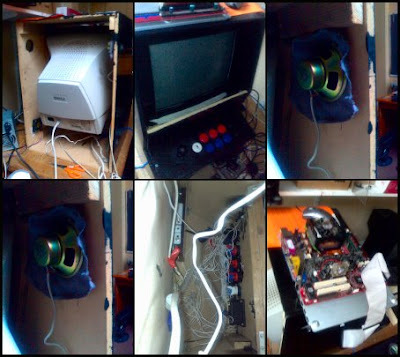 - Tidied the cabling and wires inside the cabinet. - Installed new speakers into the cabinet. We had the chance to replace the monitor with a flatscreen monitor, but in order to keep the retro 80's feel to the thing, we've kept to a traditonal CRT monitor. Still loads to do yet, but its coming along nicely. Christmas has come early... I've finally got myself a MAME cabinet!!!! As many of you know, I love playing retro games, and one of the many emulators that I use is MAME, which allows users to play classic original arcade games on a modern PC. It has always been a dream of mine to build one myself one day. Today he popped in to show me it - To say I was shocked when he said "Do you want it" is an understatement. I mean, I was prepared to give him some money for it, but he just said that he wanted to get rid of it because it was using up too much space in his house. He insisted that I just take it. 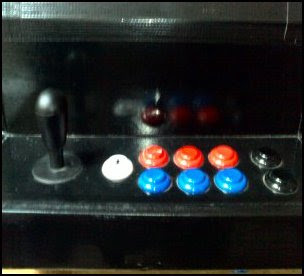 So now I am the proud owner of a custom made MAME cabinet complete with original arcade joystick and buttons (and about 13gb of arcade roms.... ssshhhhhhhh)!!! It even has a beer glass mark on the top!!! 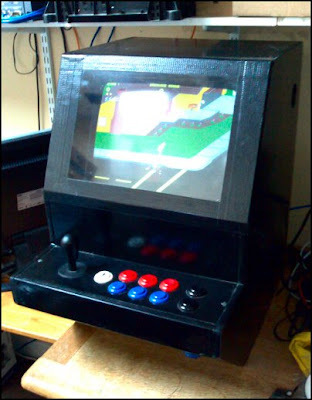 Just like an authentic arcade machine!!! It needs a little work done to it, so I have left it at the school so that me and the ICT technician can improve it during lunchtimes and after work, but it works really well. Its basically an old motherboard with 512mb onboard and an old AMD Athlon XP 2500+ processor stuck to the base of the cabinet which is made from MDF. An old CRT monitor has been placed into a slot to hold it in place, and it has had an old pair of speakers disassembled and stuck to the sides for sound. A bracket supports the harddrive to the side of the cabinet which has a very basic Windows XP operating system installed. The whole thing is set to autorun MAME32 on startup, although it it quite capable to play other emulators. A Nintendo64 emulator is also included on the drive, so it'll be great to play Mario 64 arcade style!!!!!! I can't wait for Monday now - then I can play Commando, Paperboy, Pac-Mania, Buggy Boy, Chase HQ and all of those other great games that I spent so much money on down at Southend Seafront during my childhood! Oh boy... I ache like hell!! When I was younger, I was a pretty good runner. Many times I was entered into Cross Country Running competitions when I was at school, and I always entered the long distance running events at school sports days, but over the following years I stopped doing it (and all other types of physical exercise). 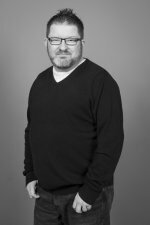 Between 2001 and 2005 I went from 8 1/2 stone to my current weight of just under 13 stone. I wouldn't call myself obsese.... Just unfit! Anyway, one of the teachers within the IT department at the school convinced me to go for a run with him - the difference between me and him though is that he is a professional runner!! With Evesham being in the Cotswolds, there are some fabulous places to do running, so last night, straight after school we went to a lovely place near Evesham - a small Cotswold village at the base of Bredon Hill. He didnt push me too hard, but I am feeling the pain of muscles that I haven't used in years. Now I understand the saying "no pain, no gain". Still, it was well worth it. When we got to the top of the hills, the views of the surrounding area were spectacular. I wish I took my camera! Who needs to pay ridiculous prices to join a gym when you can get fit, and enjoy the beautiful english countryside for free!! In other news, Kieran has enjoyed his first two days at playschool this week. He went Tuesday morning for the first time, and yesterday morning (he has two sessions per week). Expecting him to cry his eyes out when Mummy left him, he just went to play with the other children and forgota ll about us. Quite different to how I was when I went to playschool for the first time - crying the house down!! Uh-oh..... I'm on YouTube again!